A company’s brand is one of its most important assets and deserves nurturing. Despite this, many brands are created and left to their own devices. They not supported, they are not managed and they are not developed. B2B International has exceptional experience across B2B and B2C brands throughout the world. We have researched, in depth, hundreds of brands in the last two decades. 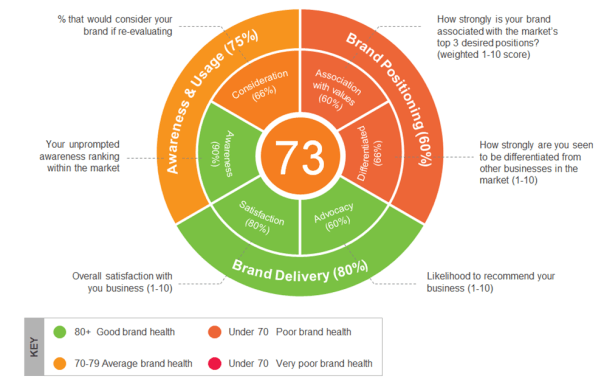 We have developed proprietary tools for assessing the strength of brands – this is our brand audit. Our starting point will be to assess whether your brand portfolio is made up of real brands or simply products which have been given a brand name (very often the case, especially in business to business markets). Brand rationalization is an important part of our brand audit and we will advise you which brands should be culled and which should be retained and developed. We will work with you to determine opportunities to rationalize your brand portfolio. When we have determined the brands to focus on, we will assess the health of each in the brand wheel. We will provide you with an expert second opinion on your brand portfolio and a recommendation on where to focus your marketing resource to best effect. Clients for whom we have carried out brand consultancy include Stanley Black & Decker, RSM International, Henkel, Alstom, George Foreman, Paslode.